Galactic Civilizations III is out today, which in itself isn't really news, because the release date was revealed back in April. However, we do have a launch trailer to accompany it, and the promise of some free stuff for people who grab the game before next week. The freebies in question are "exclusive launch weekend ship parts," which is admittedly a bit vague, but Stardock says they'll enable players to "customize their fleets further than ever." More to the point, these parts will only be available to players who spring for the game before May 18, which is this coming Monday. 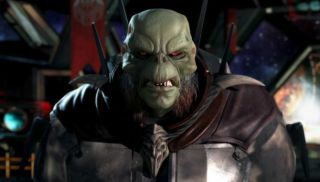 "Galactic Civilizations III brings major improvements to the franchise and the genre aside from its triple-A presentation and the sheer size and variety that its 64-bit engine enables," Stardock said. "The game is extremely mod-friendly, allowing ambitious modders to add an effectively unlimited amount of content from races to ships to entirely new technology and ideology branches or whatever else they think of. The in-game ship designer puts incredibly powerful tools in every player’s hands to create the starships of their dreams – some of the most impressive ships in the game were created by the winners of the Early Access beta ship design contest." Our review is already in the works—these things take time, especially with a game so big—so for now, have a look at lead designer Paul Boyer's super-powered PC, which is actually three systems working together as one, like some kind of giant Decepticon. Find out more (about Galactic Civilizations III, not the Decepticons) on Steam or at GalCiv3.com.